1 What Is A Botox Injection? 2 How Is A Botox Injection Performed? Botox injections entail administering onaboutlinumtoxin A, also known as the botulinum toxin, to specific muscles. A microorganism produces the toxin that is used for the injections and this toxin has been known to cause a certain type of food poisoning called botulism. Botulism may cause serious health problems, including paralysis, but injections containing small amounts of the botulinum toxin that are administered to targeted regions only cause temporary muscle relaxation, not paralysis. Because of this, it can be used to treat certain pain conditions. Although Botox is the first marketed prescription drug that contained the botulinum toxin, several newer drugs have been produced which contain this toxin. These drugs include Myobloc, Xeomin, and Dysport. They are used for similar purposes as Botox, but have different potencies and therefore, cannot be injected interchangeably. In preparation for the Botox injection, the targeted region is cleaned. 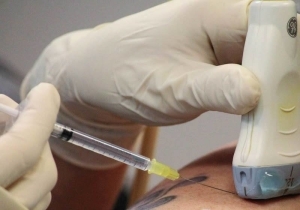 In addition, topical anesthesia can be applied to the surface of the skin, but the medication is injected with a thin needle so this usually is not necessary. During the procedure, at least two areas within the targeted region are injected with the botulinum toxin. More injections may be administered if larger areas are being treated. It typically only takes a few minutes to receive Botox injections. It is recommended that aspirin as well as anti-inflammatory medications such as ibuprofen be discontinued two weeks prior to receiving an injection. The botulinum toxin prevents signal transmission from nerves that regulate muscle movement and this causes the temporary relaxation of the targeted muscles. In some cases, results become evident almost immediately following the injections, while in other cases, it may take between three and ten days for the medication to take effect. Patients have reported effects that last for up to three to six months, in some cases. 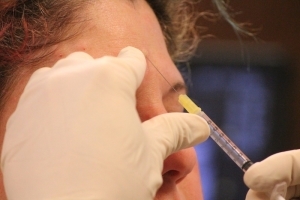 However, individuals who are suffering from chronic conditions (e.g., persistent headaches) often receive Botox injections every two to three months. Chronic conditions usually require that several doses of the botulinum toxin be administered to different areas before the effects are felt. If the Botox injections are for headaches or migraines, ptosis (droopy eyelids) may develop after the injection. Improper placement of the needle may cause the medication to be delivered to surrounding tissues. Unwanted side effects that may occur if this happens include excessive tearing, dry eyes, raised eyebrows, or a crooked smile. In addition, a rash, welts, or intense itching may occur due to an allergic reaction. In rare instances, the medication may even spread to various parts of the body that were not targeted. This can cause serious problems such as trouble speaking, breathing, or swallowing, impaired vision, bladder incontinence, and muscle weakness. Complications such as these should be immediately reported to a doctor. Botox injections were initially used to treat blepharospasm (uncontrollable blinking), neck spasms (cervical dystonia), and lazy eyes (strabismus). After its effectiveness was demonstrated, Botox injections became very popular for reducing facial wrinkles and this is still how it is primarily used. People who get migraines or chronic headaches that last for at least four hours and occur 15 or more days out of the month may be recommended for Botox treatment. In most cases, patients who have chosen to receive the injections experience dramatic relief. However, several injections have to administered to different regions of the head and this process has to be repeated every couple of months. Cervical dystonia refers to involuntary contractions of the neck and shoulder muscles that force the head, neck, and shoulders to twist and turn in a painful and abnormal manner. A similar condition, known as focal limb dystonia (e.g., sustained hand cramp), can also dramatically restrict movement. Wrist, finger, and elbow muscles may be affected by this form of dystonia as well. Some patients have reported dramatic improvements after receiving Botox injections for their dystonia. Stroke-induced paralysis and cerebral palsy are conditions that are associated with muscle contractures and have in some cases benefited from Botox injections since these injections act to relax the constricted muscles. Furthermore, Botox injections that have been administered for low back pain have demonstrated the ability to reduce muscle tension and pain. A Botox injection involves the administration of the botulinum toxin into targeted muscle tissue. Small amounts of the botulinum toxin, which are used for Botox injections, cause temporary muscle relaxation by blocking signal transmission from nerves that regulate muscle contractions. Botox injections have been deemed safe to treat various conditions such as migraines, chronic headaches, cervical dystonia (neck spasms), focal limb dystonia (upper limb spasticity), muscle contractures, and low back pain. This non-invasive procedure does not require anesthesia and is usually complete after just a few minutes. The effects can last for up to six months and can quickly be repeated without causing harmful long-term effects. Chan VW, McCabe EJ, MacGregor DL. Botox treatment for migraine and chronic daily headache in adolescents. J Neurosci Nurs. 2009; 41(5):235-43. Yelnik A, Colle F, Bonan I, Bradai N. Efficacy at six months of the botulinum toxin A in the post-stroke lower limb’s muscular overactivity. Ann Readapt Med Phys. 2002;45(4):159-65. Gill C, Covington C, Padaliya B, Newman W, Pomeroy T, Charles PD. Successful treatment of childhood spasticity secondary to cerebral palsy using Botox. Tenn Med. 2003; 96(11):511-3. Ramirez-Castaneda J, Jankovic J. Long-term efficacy, safety, and side effect profile of botulinum toxin in dystonia: a 20-year follow-up. Toxicon. 2014; 90:344-8. Jabbari B, Ney J, Sichani A, Monacci W, Foster L, Difazio M. Treatment of refractory, chronic low back pain with botulinum neurotoxin A: an open-label, pilot study. Pain Med. 2006; 7(3):260-4.